Select the frequency, campaigns, and type of change rules that you want to trigger a Rank Change Report to be sent to you daily, weekly or monthly. If your SEO software package allows for multiple users, you should take advantage of that feature and create user logins for each person who is authorized to manage rank tracking campaigns, client dashboards, white label PDF reports, profiles and/or links. When an authorized user logs in and accesses the Email Notifications screen, they are able to create notifications that will be sent to their email address. If everyone uses the account default login, email notifications are only sent to the account default email address. Settings are located in the Tools > Email Notifications section of Rank Ranger. A report like this can be sent to your email address. There are a few circumstances that can cause a dash (-), question mark (? ), or number in parentheses (7) to display in your rank change report. In the above example, it's easy to see that "fast weight loss" has moved up 16 positions to the #1 ranked position on Bing USA, and that "weight watchers" dropped 11 positions down to the #20 rank on Yahoo USA. A question mark ? 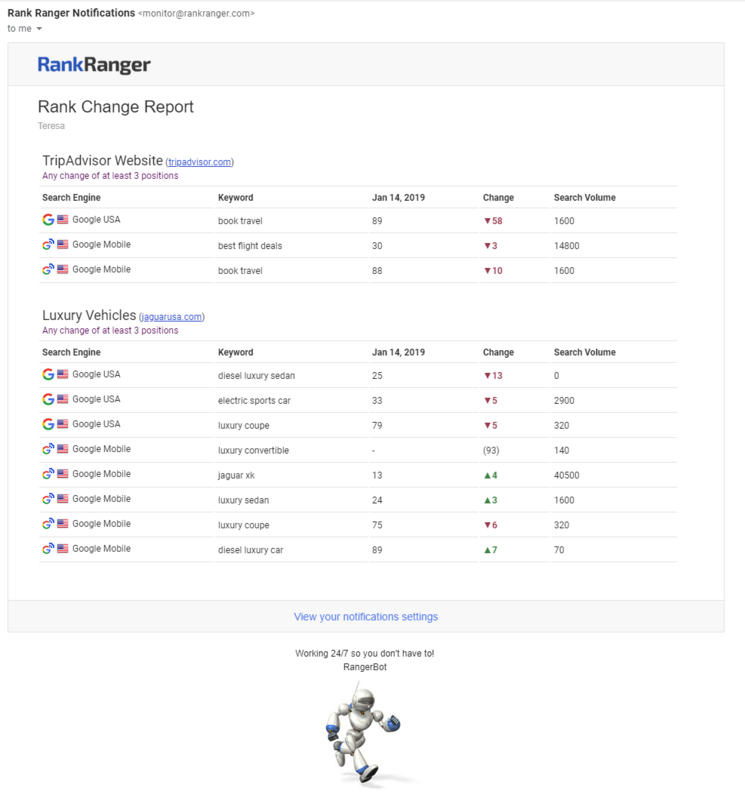 signifies that RangerBot is unable to calculate the difference between the previous rank and current rank; most likely because the previous rank did not fall within the maximum number of results tracked. In the example above, we're viewing a weekly rank change report and the keyword "weight loss plans" dropped from the top 100 results in Bing USA search a week prior to the report date, and then recovered in the number 1 rank position on the report date. This may have been due to a number of factors including campaign settings changes, a Bing algorithm change or experiment at a particular data center, or even highly aggressive competitors. A dash - indicates that the keyword is not ranking at all within the maximum supported results tracked by each search engine (refer to our current list of supported search engines for rank depth and additional information). And the number in parentheses above (7) indicates that "weight watchers" had been in rank position 7 on Bing USA a week before the report was run, but on the report date was not ranking at all. Select All Campaigns or check only the campaigns for which you want to receive notifications. Select the Rank Change Rules to be applied to each individual campaign. Important: Please whitelist monitor@rankranger.com to ensure that your email alerts don't get labeled as spam or blocked by your email server.